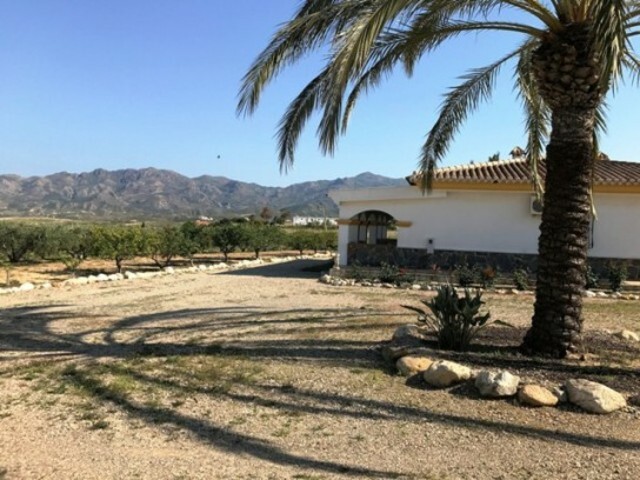 Detached 3 bed / 3 bath Villa with private swimming pool in the village of El Pina de Bédar, approx. 15 minutes to the sea with magnificent coastal views being sold for an unbelievable low asking price! The freehold plot measures 400 mts2 and has a built area of 129.91 mts2 distributed between two levels. Lower level: entrance hall, bedroom with en suite bathroom, bedroom, family bathroom, lounge / dining room and kitchen. Upper level: master bedroom with en suite bedroom and dressing area. The house is surrounded by terraces on both levels with extremely good views (village, mountains and the sea). The pool and its terracing is at the lower level of the Villa and it offers great views too. The property is completely double glazed, has an area for BBQ, etc. The underbuilt of the villa is used as storage area. If it’s a fair priced, quality villa, relatively close to the coast what you are looking for then view this one and you will not be disappointed. For more information or to book a viewing appointment please visit our office or contact us via phone or e-mail.